I met so many great food vendors at the IFBC 2014 in Seattle. One of my favorite sessions was presented by Krusteaz . Krusteaz’s Culinary Specialist Malia Hasegawa and event stylist and entertaining personality Jennifer Sbranti of Hostess with the Mostess had a fun filled session where they gave us “out-of-box” recipes and some great tips on table setting and entertaining ideas. This is a local family business started here in the Northwest. I learned from the founders grandson that it all started back in 1932 with one man, a group of woman from a Seattle bridge club and a pie! The first product that Krusteaz (a cleaver combination of “crust” and “ease”) made was a boxed pie crust. Since then they added pancake mix, biscuits, muffins, brownies, breads, desserts and more. One of their newest mixes are three different Krusteaz Flatbreads but we will save that for another post. During the presentation Malia and Jennifer gave us so many ideas I wanted to go home and start creating myself. 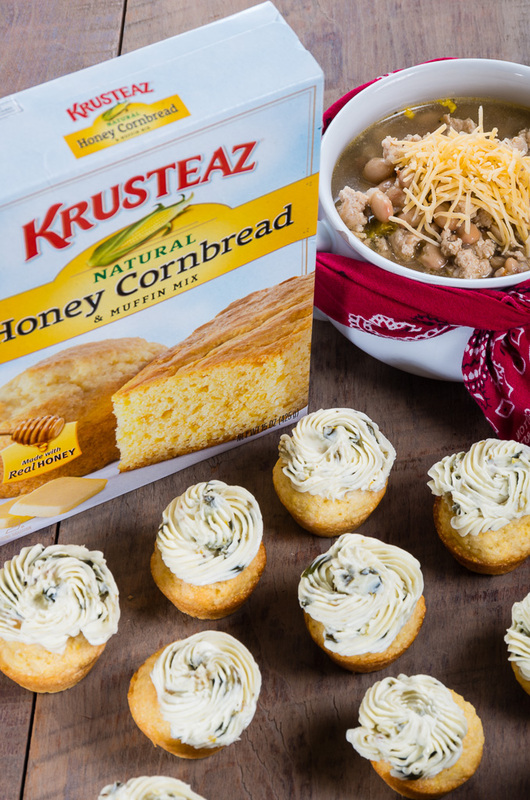 With the cool weather upon us and football tailgating I decided to make an easy pop in your mouth treat using the Krusteaz Honey Cornbread & Muffin Mix. The recipe is easy and quick to make but you need to have some “Cowboy Candy” around to make this sweet and spicy little popper. Preheat oven to 400 degrees. 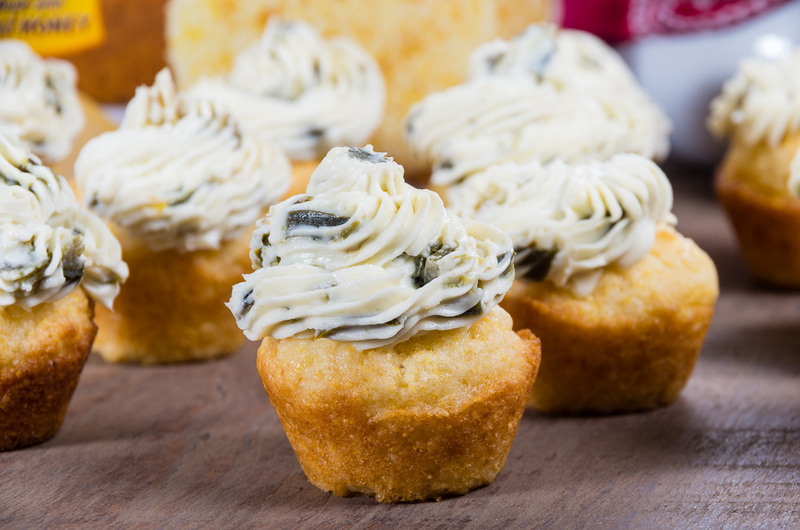 Prepare mini muffin pans by spraying 36 mini muffin cups with a non stick spray. 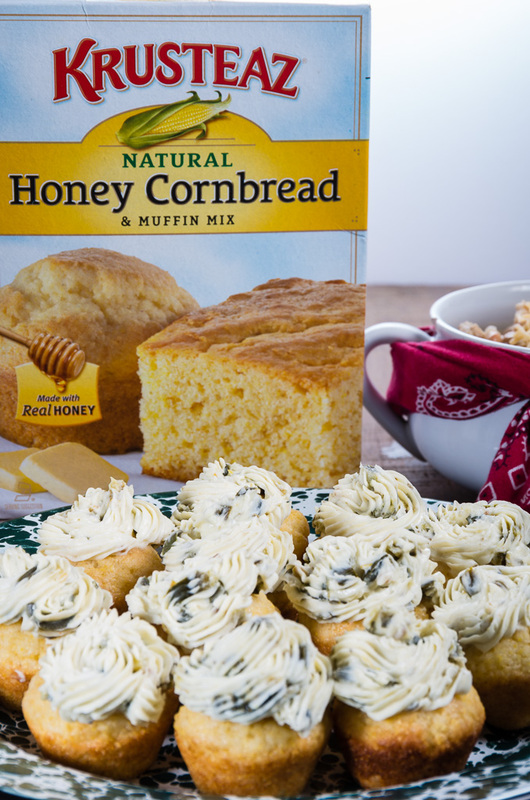 In medium bowl combine the Krusteaz Honey Cornbread mix, milk, oil and egg until moistened, do not over mix. Scoop into mini muffin pans and bake for 11-13 minutes or until golden brown. Cool in pans for 5 minutes, remove from pan and cool on a wire rack. Combine in the bowl of a stand mixer the cream cheese and cowboy candy. Mix until combined and soft, about 1 minute. Place in a icing bag that has been fitted with a large tip and pipe onto cooled muffins. These are ready to serve or refrigerate for later.